MSD 358; fleet number NT1494, is a 1959 Bristol MW6G, one of 52 with Alexander C41F bodies built for Western SMT. They remained in service until 1977, which speaks volumes for the build quality of the body and chassis and the thoroughness of Western’s maintenance programme. The wheel trims on the vehicle behind would suggest that its an AEC, it has a coach door, and at the risk of splitting hairs I would say this ones folding doors and grab rails on the backs of the seats are more the type associated with a DP rather than a coach. This style of body was widely used by SMT group operators, and they were a common sight on the Newcastle to Edinburgh and Glasgow services jointly operated with United. They have a resemblance to the Park Royal bodies of the era, and I always thought they were attractive vehicle. However, unlike the later ‘Y’ type that became a common sight throughout the UK, they were never that popular South of the Border, although North Western did have a few. 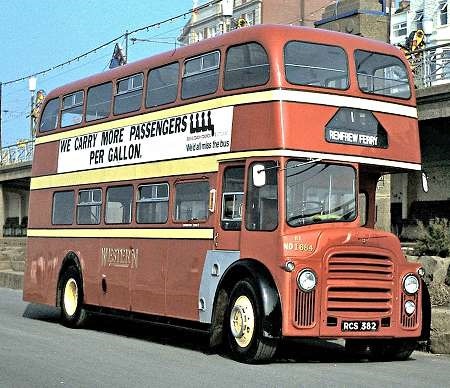 North Western’s used the BET standard bus shell (known to Alexander as the Z type) with a straight waist-rail and equal windows throughout the length except for the very rear. Alexanders just stuck their front end (as seen on this vehicle) onto the BET spec body. North Western called them "Highlanders" and painted them in coach livery. As a coach they made a perfectly acceptable dual-purpose vehicle! Ronnie, I think you’ll find that North Western’s examples were of the straight waistrail variant. You could almost say that this one anticipated bus grant type doors by a good few years! The North Western vehicles came in 1961as Reliances in 30 ft length with a straight window line and equal length windows plus roof quarter lights. They were followed in 1962 by the 36 ft version on the Leopard chassis. Strange to think that they also had almost identical Guys. Both were highly regarded so must simply have been a dual sourcing thing. Strictly speaking, the only English examples belonged to Barton – North Western never had any of these. What North Western DID have were standard BET bodies (built by Alexanders) but with this front grafted on. These were on Reliances and its first PSU3 Leopards. The recent book on the Y type points out that this twin flat screen design lasted into the ’80s as it was still being used on AL deckers – such as those delivered between 1973 and 1981 to STD and, later, SYPTE. Fully agree with the quality of build and good maintenance Ronnie – I recall the Guys working out of Carlisle on services to Annan as late as 1976. What struck me most about Western SMT in those days was that the vehicles were usually turned out in an immaculate condition. The fully lined out livery was also superb though it lost its edge once standard SBG fleet names replaced gold at the end of the decade. As well as Barton James Smith & Co (Wigan) Ltd and the associated Webster Bros (Wigan) both had Leyland Tiger Cub versions of this body. The six Barton Tiger Cubs were operated for over 19 years and then sold on to other operators. Now that is long service particularly as Tiger Cubs were considered by many to be too lightweight and not up to the job! I stand corrected. Thanks, chaps. Note the use of service number ’30X’. The joint Western SMT/Ribble Lancashire-Scottish services, on paper at least, carried different service numbers north and south of Carlisle. The daytime Manchester-Glasgow service was X30 in the Ribble series (and therefore the service number south of Carlisle) and 97A in the WSMT series (north of Carlisle). Maybe WSMT didn’t have letters in the first of the three ‘number’ blinds and so ‘X30′ was displayed as ’30X’. The night service was numbered X20 and 97B on the same basis. In the summer 1964 timetable the northbound X30 took 9 hours 45 minutes end to end (9 hours 33 minutes southbound). Quite a marathon! Can anyone tell if this photo was taken in the Manchester area? Perhaps the railway catenary at top right is a clue? Manchester is highly plausible, since very few places had overhead electrified railways in 1959. Manchester had two going on three (Altrincham and Sheffield, with Crewe in progress). So, taking a stab in the dark, I’d suggest the pointy building in the background is not unlike the City Road Inn at the junction of Albion Street and Whitworth Street West. That’s right beside the Altrincham line and a stone’s throw from Lower Moseley Street bus station. Though looking on Street View its hard to place the viewpoint. But so much as obviously changed around there in the intervening 55 years. Keith has the location spot on as far as I’m concerned. This was a regular overflow parking spot for Lower Mosley St Bus Station. There was also a 1955 example of this style for Kingston Coaches on Guy Arab LUF; the furthest south this style got. Alan Oxley will know but I think either Barton or Western SMT were the last customer for this version, Barton switching to Reliances from 1955. By 1956 the Alexander and SOL were taking a straight waist variant. 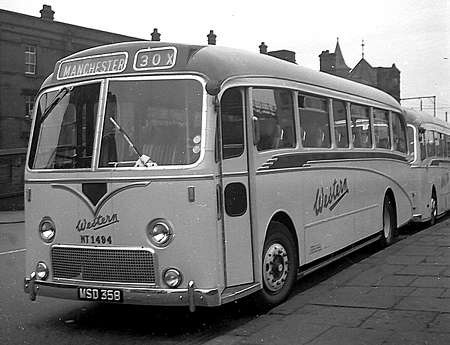 In the late 60’s, as a student, I travelled several times on the night bus from Manchester to Glasgow. I don’t know about other nights of the week, but on Fridays there were so many passengers that there were three buses. Once you were "in the know", if you were going all the way to Glasgow, it paid to turn up at Lower Moseley Street half an hour in advance of the scheduled time as the first of the three buses would leave early and full and only stop at Penrith for toilets and the all-night cafe. The first time I made the journey, I was on the third bus, which left at the advertised time and stopped everywhere, of course getting to Penrith just after a lot of other buses going north and south so the queue at the cafe was just too long to contemplate. As I remember it, though, even the third bus would arrive at Glasgow much earlier than timetabled. Western SMT took fifty-eight of these handsome preselector Regent III’s with Northern Counties lowbridge bodies between 1947 and 1950, being registered BSD 401 to 458, Strangely, BSD 441 of 1949 never entered service with them and was immediately sold to the independent York Bros. of Northampton. The rest of them continued with WSMT until withdrawal between 1962 and 1965. 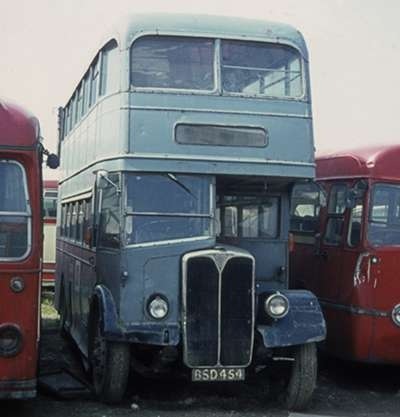 BSD 454 had survived a further seven years or so with an unidentified owner until being sold to North’s, the dealer, of Sherburn-in-Elmet – in whose yard it is seen here awaiting its final fate in the Summer of 1970. It would be interesting to know why BSD 441 was sold without being used – does anybody know? "an unidentified owner" could be some sort of contractor, using the vehicle for staff transport, if the markings on the offside are any guide. Is that a Weymann coach body behind her? Looks like a Fanfare to me, Hawkeye…..
At a rough guess it is probably a Yorkshire Woollen Fanfare. I don’t know why BSD 441 was sold unused. But I do know that 6 further buses were diverted to Hants & Dorset on the south coast. They were very non-standard for this company, but lived out a reasonably full service life. They were numbered 1213-1218, and registered JEL 752-757 in Bournemouth, as would be expected for H&D stock at that time. I believe that this transfer was at the instruction of the BTC, as both H&D’s parent, the Tilling Group, and Western SMT’s parent SBG had recently been nationalised. Presumably a Whitehall boffin felt that such a transfer made sense…?? They were fitted with Tilling-style destination screens, although not so deep as the normal standard. ‘Bus Lists On The Web’ gives Western 548 as having had the registration BCS 453 rather than BSD 453. Conversely, Western 394, the last of a batch of 22 Northern Counties bodied Daimler CVA6s, is given as BSD 453, whereas the previous 21 are shown BCS 429/31-3/5-41/3-52. There is a pic on the net of 548 displaying the registration BCS 453, when with subsequent operator Laycock of Barnoldswick. Almost as strange as the ‘BSD 441’ enigma. The single decker on the right of the picture looks to be a Lancashire United Guy UF with Weymann Hermes body, one of six delivered in 1954. The front of these bodies was different to the standard Hermes body having a curve to lower windscreen line to match previous Atkinson Alphas with bodies by Northern Counties, Roe and Willowbrook but being different in detail around the cab windows. Concur with you on the LUT UF, it was my thought straight away on seeing first sight. I didn’t record the details of the other vehicles in the photo, but can confirm that the one on the right is an ex-LUT WTB-reg Arab LUF. There were others of the batch at North’s on that day, I have another photo which includes WTB 71. The bus to the left is one of several ex-WYRCC LS’s, and in the background an ex-YWD Fanfare, of which there were others.